Family waiting for the parade. I live in a town only large enough to support one grocery store but we do have a library and a community center and on the Fourth of July everyone comes out to play. In the past our parades have consisted primarily of the boy scouts and brownies, swim and football teams, the city council and anyone running for office, every classic car in town, kids on tricycles, local war heroes, high school marching bands and lots of dogs, hot and otherwise. 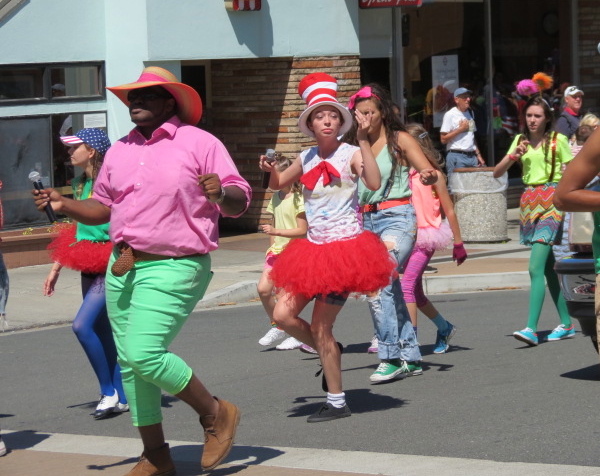 This year we had the characters from the musical Seussical grooving in brightly colored costumes to raga tunes. I think they were sponsored by one of the banks and not Coors but just seeing them made me crave a beer. 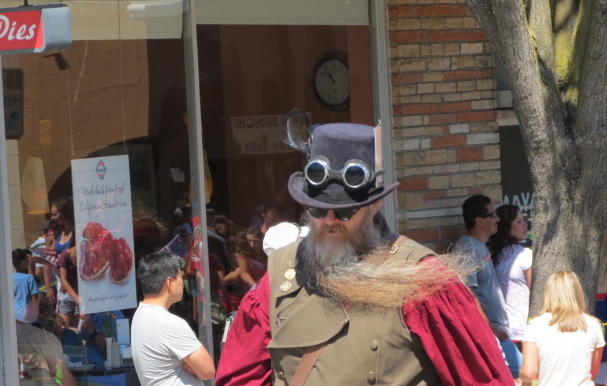 The tiny theatrical group in town, which puts on mostly murder mysteries in an outdoor theater also marched – in costume, of course. 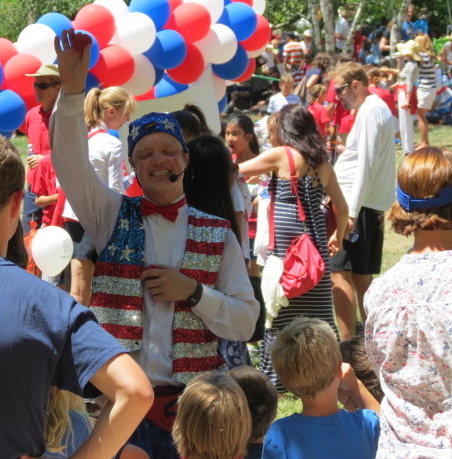 Not new, but always entertaining, was the juggler who rode a unicycle in the parade and then entertained the children at the local park while their parents drank beer and listened to a jazz band. He appeared to be having as much fun as the kids. New, and probably the most unusual of the participants, was the Stilt Lady, dancing a Brazilian rumba. I’m afraid of heights so she terrified me. 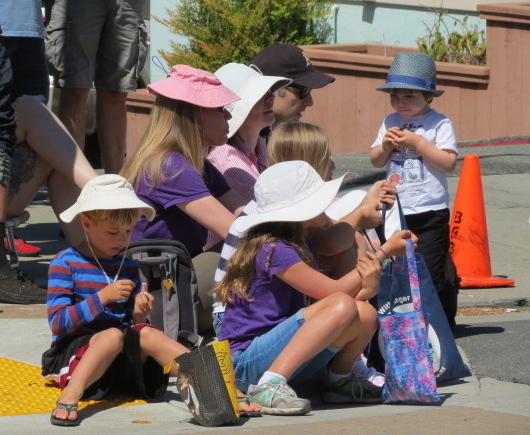 When I first moved to this area over twenty years ago there weren’t that many “people of color” in the parade, however, as my neighbor noted, that is changing as is the town. It’s a good thing to see. On the way home Hubby and I stopped at the local Mexican restaurant for margaritas and to watch the World Cup. Our waitress had an American flag sticking out of her French braid and spoke with a such a strong accent naturally we had to start up a conversation with her. 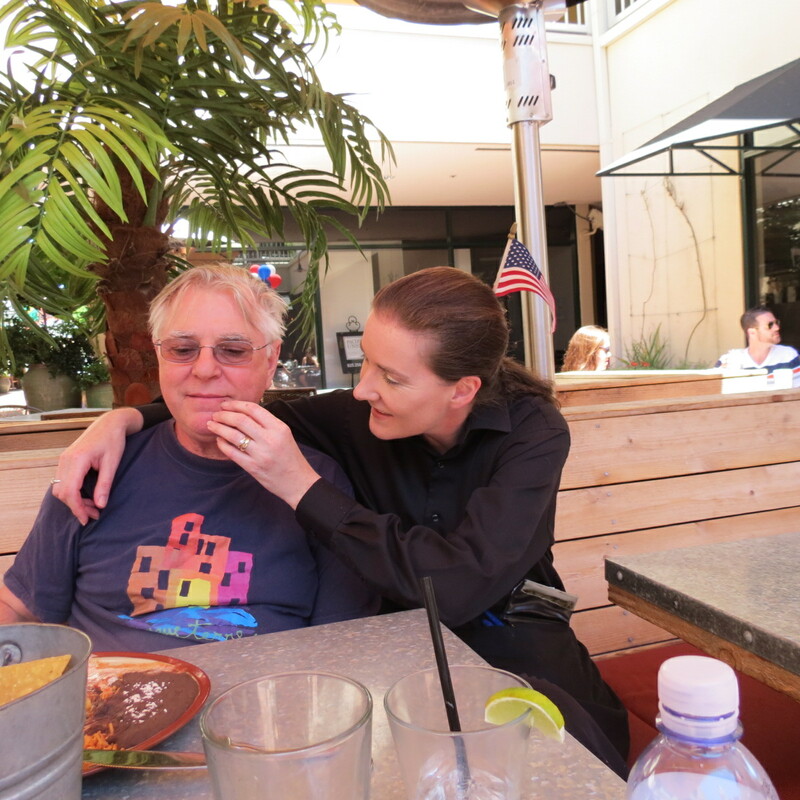 It happened to be her very first Fourth of July as an American citizen, having migrated from Northern Ireland. Now, I don’t like what’s happening in this country – all the hatred and division. Some days I’m so fearful of the future I’m tempted to migrate elsewhere but she had such a glow about her that I decided not to ruin the day with politics. Even my hubby held his tongue. It was, after all, the Fourth. This entry was posted in Pets, Posts and tagged Fourth of July, parades, small town. Bookmark the permalink. Lovely post, Jan! This is what the 4th is all about: small town parades and people from different places getting along with each other. Thanks Mary. Couldn’t agree more. Small-town parades are so quirky and fun. How many others would have a Stilt Lady dancing a Brazilian Rumba? I agree – for the Fourth, I’d much prefer to be at a small town celebration. Thx for the comment! I love the passion with which you describe this exclusively American festival. Thanks Owain – I must admit, my little town knows how to get it right. Colourful pictures and colourful warming account of a great day out. Is that a glint I see in the eye of that man of yours? I’d keep YOUR eye on him if I were you! She was cleaning the slobber off his chin for the picture! I love this post. What a great parade! I grew up in a town of less than 5,000 people. Reading about your parade brought back such memories. Thank you, Jan. I love this post and small towns! I live in the downtown/historic district of what I call a large town, and love the small town atmosphere on Main Street. 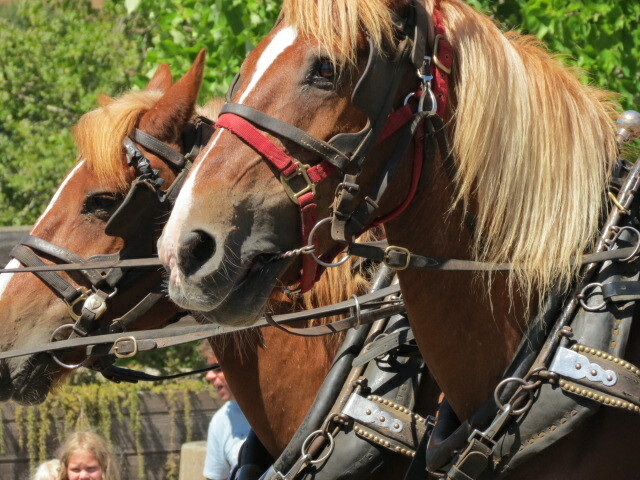 The town holds parades, Friday night concerts, and celebrations for just about everything. Thanks for sharing another great post, Jan!